The countries of the Caucasus region each continue to march down very different economic paths, despite their proximity and sociocultural connections. “In an ideal world, Azerbaijan, Armenia and Georgia would pursue regional integration; they would be looking to boost mutual trade and investment and trying to make their small economies more complementary. But this isn’t an ideal world, particularly in the Southern Caucasus,” says Neil MacFarlane, Caucasus specialist at St Anne’s College, Oxford University. Nothing on the horizon suggests that MacFarlane’s skepticism about the region is amiss. The three countries have long been separated by a number of things, including different attitudes to relations with Russia and the West and contrasting plans for economic reform. In the cases of Armenia and Azerbaijan, that divide is exacerbated by continued tensions over the Nagorno-Karabakh region. This year will mark the 20th anniversary of fighting that saw the Azeri territory of Nagorno-Karabakh fall under Armenian control. With Azerbaijan putting much of its energy earnings into its military, and border skirmishes not uncommon, renewed hostilities remain very possible. However there is also a widespread feeling among Caucasus watchers that in 2014, the South Caucasus is at a historic crossroads, with all three countries destined for very different futures. Presidential elections were held in all three last year. In Armenia, Serzh Sargsyan was given another five-year tenure in a controversial vote in February that his critics alleged was rigged. Eight months later, Azerbaijan’s authoritarian president Ilham Aliyev secured an unsurprising 85% of the vote. Only in Georgia were elections free: In October, Giorgi Margvelashvili of Georgia Dream (the broad coalition set up by Bidzina Ivanishvili, Georgia’s richest man and former prime minister) beat David Bakradze of the United National Movement, the party of former president Mikheil Saakashvili. The biggest gamble is being taken by poor, landlocked Armenia, which—mindful of the threat posed by an economically and militarily resurgent Azerbaijan and poor relations with neighboring Turkey, and haunted by the looming 100-year anniversary of the Armenia massacre—has thrown in its lot with Russia. Military cooperation between the two increased after a defense pact signed in 2010. Armenia’s economy already depends heavily on Russia, its biggest trade partner and source of most of the $1 billion in remittances that sustain the national budget. However, Armenia’s decision to spurn an agreement with the EU and opt instead to join Moscow’s fledgling Eurasian Union (conflicting rules make mutual membership impossible) has observers wondering what the outcome will be. “Joining the Eurasian customs union will likely have a positive economic impact in the short term, [not least because] the price of gas is reduced from $270 to $189 per trillion cubic meters, which will help narrow the sizable current-account deficit,” says a senior economist at the EBRD. Over the long term, however, Armenia—whose population of 2.9 million is shrinking fast, owing to emigration (some 40,000 relocated last year)—faces questions about how its small economy can retain any viability, even if it continues on its path of implementing reforms. The government has focused on the business environment, and indexes compiled by the likes of Transparency International and the World Bank show distinct improvements in such areas as opening a business. But will this boost much-needed FDI or economic development? “In essence, Armenia is still run by an oligarchy which controls most things that happen in the economy. It is isolated, with access to major markets complicated because the only way these can be accessed is through Georgia,” says MacFarlane. Attracting global interest is hardly a problem for Azerbaijan, whose economy now accounts for 80% of South Caucasus’ GDP and continues to be driven by the omnipresent energy sector. 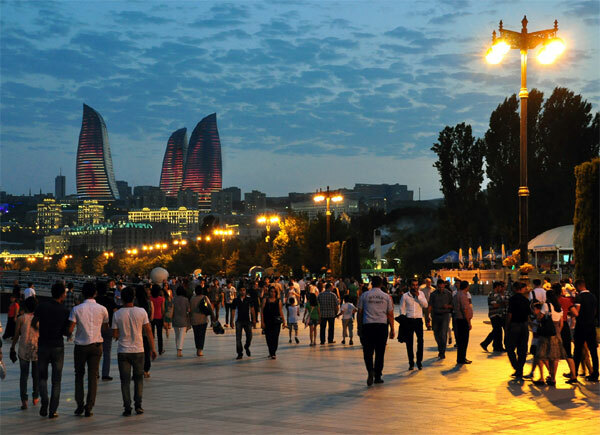 The opening in 2012 of capital city Baku’s iconic Flame Towers—designed to highlight Zoroastrian traditions—has reinforced the sense that this is a city in transition. Indeed, there are so many five-star hotels and luxury shops and restaurants that many locals now nickname it Vegas on the Caspian. By Caucasus standards, after two years of drift, the Azerbaijani economy is growing fast: Last year growth was boosted by pre-election fiscal and monetary stimuli and a rise in oil output. The non-oil sector expanded at near-double-digit rates, benefiting from increased public spending and expansion of credit, and now accounts for almost 50% of GDP—against 38% five years ago. However, energy still dominates the economy. Georgia remains unambiguously pro-Western, having initialed its association agreement with the EU in Vilnius last November. Exporters hope to see benefits from duty-free access to the EU. President Giorgi Margvelashvili, on the other hand, admits that much remains to be done to bring the legal system and economy into line with EU norms if, as hoped, a trade agreement is to be signed before the year-end. Unemployment, moreover, remains high at 15%, compared to roughly 5% for Azerbaijan and Armenia. But the hope is that Georgia’s continuing rise through the World Bank’s Doing Business table will encourage both foreign and domestic investment. “The year 2014 will be a year when the three countries move further away from each other...with closer mutual cooperation complicated by politics and the poor state of infrastructure, particularly outside the main cities,” notes Amanda Paul, Caucasus analyst at think tank the European Policy Centre in Brussels. Regional uncertainty and proximity to Turkey has held back investment, says Paul, with companies seeking domestic market access basing themselves in Turkey rather than locally. FDI has still not recovered from the slump it went into after 2008. “Some negative factors are common for all, including still-subdued growth in the EU and Russia; the difficult geopolitical environment, which restrains trade; still relatively poor infrastructure; and small domestic markets,” says a senior EBRD economist. 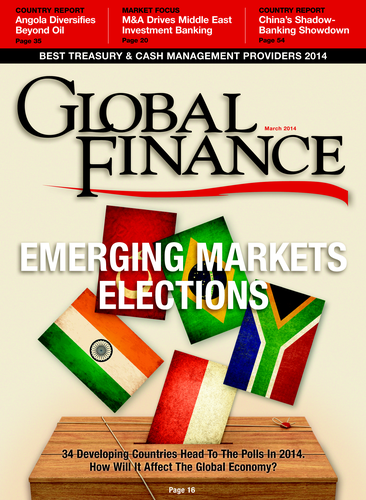 That said, the countries—aided by international financial institutions (IFIs) like EBRD—have been seeking to ameliorate conditions, particularly for small and midsize enterprises, and are prioritizing key sectors (agribusiness and tourism in Georgia, energy in Azerbaijan and infrastructure in all three). Regional banks have been seeking foreign investors and capital with some success: Georgia now has a fairly advanced bank sector, and Bank of Georgia is listed on the London Stock Exchange, while Armenia also has a surprisingly competitive financial sector. The big challenge is to reduce the high level of dollarization (currency substitution), which in Georgia and Armenia is around 60% (against 40% in Azerbaijan). To this end IFIs have been seeking to develop local currency markets, with the aim of also reducing dependence on (scarce) foreign capital. On January 31, 2014, the EBRD launched the latest of these initiatives, an inaugural one-year bond in Armenian dram worth Amd2 billion (around $5 million) on the Nasdaq OMX exchange in Yerevan. “This is a very significant step for the Armenian capital market and opens the way for further capital raising in Armenia by those seeking to [lend] drams to the real economy, thereby ensuring a better fit for borrowers who want to avoid foreign currency risk,” said Mark Davis of the EBRD’s Yerevan office. Observers say there is more these countries can do to improve their prospects. Georgia would benefit from more predictability and better communication of government policies. In Armenia strengthening competition and reducing corruption could bring major benefits, while Azerbaijan would do well to make comprehensive reforms in business regulation, trade, competition and taxation. It would also benefit from pursuing WTO membership. But will any of these things happen? “Prospects for reform in Azerbaijan and Georgia this year look pretty discouraging,” argues Alex Brideau, Caucasus specialist with the Eurasia Group in Washington, DC. He suggests Aliyev’s broadly statist, energy-sector-focused policies will likely remain unchanged in the former, while the latter’s relatively new government and president face very real questions about their ability to pursue their pro-EU and pro-NATO goals. “This year and the next one or two will be very significant—it will then become clearer what will be the consequences of the political and economic choices taken [now],” Brideau predicts.